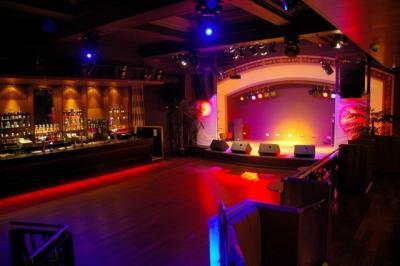 Glasgowmusic.co.uk - Venue : "Classic Grand"
550 capacity, including a separate, elevated bar of 50 capacity. This can be used for VIP access or open to all customers. It is also possible to reconfigure this main room�s capacity to 350. Sound & lighting desks and DJ booth are elevated at VIP bar. Stage size is 4.7m deep by 8m wide. Ability to project on-stage from PC / DVD for visuals - projector and screen available on request at additional cost. 250 capacity. DJ Booth / sound desk / stage lighting controls located by bar. There is a purpose built main dressing room with toilets and showers for the headline artist. This has private access to the stage and for more profile artists or larger events the smaller downstairs venue could be reserved for additional dressing room space - **please note this may have implications on other club nights etc**, and would to be negotiated separately. This area and the main room is also ideal for VIP and aftershows. For support artists there will be an area to store guitars etc but it would be at the promoters discretion if the dressing room areas were to be shared. There is free off street parking available 50 metres from the venue which will take a tour bus + 2-3 small vans/cars. There is wireless access, phone and printer in the production office, which can be utilised for production staff on request. PA spec is below, the room has 3 x ISDN2 for live radio, a track route to feed fibre optic for live broadcast. System is an EV X-Line XLVC system, with frill EV Amps and Processing, set up as Five Way, using the XLD-28 1 as a three way Box. There are two hangs (one either side of the stage) each comprising of five XLD281 and two X5212 flown behind them. Beneath each hang is an X-Sub. Please note: It is not possible to use a separate monitor desk in this venue due to space issues. The Verona is set up to give six monitor mixes (including drumfill). There are two PROEL TFLV12-P4 Monitor speakers that may be used as FOH monitors if required, alternatively if there is an Rxl 15 not in use on stage this may be used. Stage lighting consists of 24 Par 64 Cans with a Zero 88 Jester desk, controllable from FOH. The cans are laid out as follows; two bars of six Upstage (all lamps are CP86) with a further bar of six sited in front of the stage (lamps are CP62). In line with this central bar are two short bars of three at either side with three cans on each bar (lamps are CP62). In addition to this there are four Robe ColorSpot 575 AT fixtures over the Dance Floor which may be used to point towards the stage and two Robe Scan 575 XT Fixtures located one next to each PA Hang, With another across the room. Control for these intelligent fixtures is via a Robe DMX Control 1024 Desk.